the woodruff-fontaine house museum will be closed easter sunday, april 21st. we will reopen for scheduled historic tours on wednesday, april 24th at noon. The Woodruff-Fontaine Museum has one of the most extensive Victorian era fashion to 1920’s textile collections in the South. We have over 4,000 pieces in our collection from wedding gowns to undergarments and everything in between. We change our displays several times a year, so there’s always something new to see. Some highlights of our collections include an exquisite bustled wedding gown, which cost “thousands of dollars” in 1880, a black wedding gown worn by a 14-year-old bride in mourning, a very rare black silk maternity mourning dress, and a Worth gown. We also have many Edwardian lace tea dresses with intricately embellished bodices and a large collection of antique children’s clothing. Beautifully embroidered petticoats, corsets, stockings, shifts, nightgowns and robes complete our "unmentionables" collection. Be sure to check our exhibition schedule below for the current showcase in the Woodruff-Fontaine House. Timeless Romance Exhibition February 1 - March 17: This romantic exhibition is beautifully set for spring with textiles in shades of pink and purple heralding the season of love! Tour all three floors to unlock the rules of Victorian courtship, understand the language of fans and flowers, and fall in love with the Woodruff-Fontaine's own historical love stories. Two Centuries on the Mississippi: Refinement on the River April 5 - May 19 Before Memphis was known for Blues and BBQ, we were known for Railroads, River Traffic and King Cotton! Our Bicentennial Exhibition will showcase what was once the Gilded Age of Memphis. All three floors will be full of historical photos and information about this by-gone era that will never be forgotten. Wedding Belles Exhibition June 7 - June 23: Join us for the exhibition opening of “Wedding Belles”. Exquisite wedding gowns from our collection will be on display through the month of June. Tour the mansion and view our blushing brides, many with a unique story from right here in Tennessee! Southern Summers July 7 - July 21 Woodruff-Fontaine House Museum invites you to celebrate all things “Summer” with us! Take a closer look at some of our Southern customs and traditions that only happen during the dog days of summer. A collection of cool, crisp and “barely there” cotton textiles will be on display throughout the museum. Yellow Jack Exhibition August 2 - August 18: Take refuge from the summer heat and help us shutter up the mansion! Yellow Fever is coming to 680 Adams Avenue and we’re preparing the mansion for a season of mourning. The dimly lit mansion will be staged as the 1878 Yellow Fever Epidemic will be recounted and our martyrs remembered. Mourning Memphis Exhibition September 6 - October 27: The “princely mansion”comes alive when there is talk of the dead. 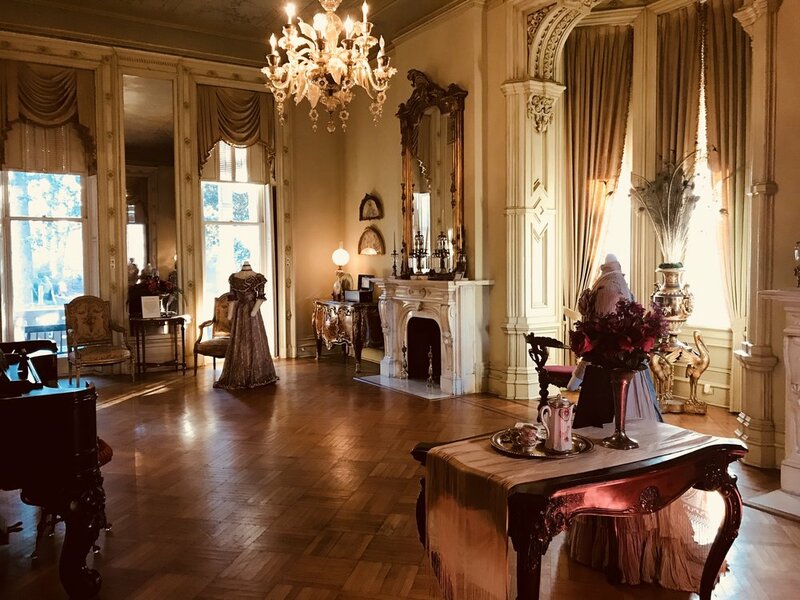 Stroll the darkened halls and hear the tales of the first families, while viewing our beautiful mourning collection displayed and staged throughout the mansion. Victorian Yuletide Exhibition December 6 - January 5, 2020: The Woodruff-Fontaine House will be dressed in holiday splendor! Our annual exhibition includes old Southern Yuletide traditions and customs. Stroll all three floors and see why this is the season to be merry!